Here is the white sandwich bread from Julia Child's Baking with Master Chefs. I made one pan loaf and one small round. It is a great white bread that my girls love. It does not have the integrity of the Jamaican hard do, but it is rich in flavor and texture. Next up is the honey wheat sourdough I have been working on. It is still too warm to slice, so I can't be sure of the crumb, but it is nice and firm, has good lift, and a great smell. Once I am sure of the crumb and taste, I will post the recipe. Here are some moist, rich, and chewy double chocolate brownies. And finally, one of my family's favorites: Pizza! Pizza in all its simplicity: sauce, cheese, fresh basil and oregano, and pepperoni on one of them. Tomorrow will bring baguettes and focaccia. can you post the pizza dough recipe, it looks great, is this an overnight dough in the fridge ect, makes me hungary and it's only breakfast time. As a breakfast food, too. All the essential food groups are present, right? Nice bread, hope you give recipes. The pizza is awesome and the brownies too but I tried not to look at them...trying to quit the sweets :o) Hope you give the pizza recipe too. The recipe has been added. I will give the recipe for the wheat bread and the results of the baguettes in an addendum to this post. You've had a busy weekend! Everything looks great and I am also interested in your pizza recipe. Did you bake your pizza in the oven & if so, at what temperature and did yo use a baking stone? I like little more than having the time to devote to baking and spending time with my family. I have a ton of papers to grade by next week, so I am still having a busy weekend (the wife is wagging her finger even now for me to return to that task). I do use a baking stone, but I think this could be done on a tray lined with parchment. Maybe one large pizza on a full cookie sheet? The only problem there would be less crust, and that's the family's favorite part. I fear if I tried it I would start a revolt. I don't intend to challenge your faith, but temptation is good, right? It keeps you strong! Your house must have had some wonderful aroma's! It smells like bread all weekend. Best air freshener ever! Your pizza looks awesome! They must sold out in a minute!!! Very nice!!! First, heat your oven with a stone in. If you don't have a stone, try this on a sheet pan. I have not, but it would probably yield good results. Turn the oven to 500 degrees with your stone in. I have two stones, so I position them on the bottom rack and the second to top rack. If you use one stone, put it on the bottom rack. While the oven is heating, mix the dough. Combine 8 grams of dry yeast with 360 grams of water to dissolve. Mix 9 grams of salt (we use gray sea salt, but use whatever you normally do; if it is a large grain salt, crush it before adding it to the flour to help it dissolve) into 450 grams of bread flour in your stand mixer (you may be able to do this by hand, but I would not want to try). Add the water-yeast mixture, and mix to form a dough. Once the flour is all incorporated, turn the mixer to high and mix with the dough hook 10 minutes. Transfer to a bowl greased with olive oil, cover with plastic wrap (or a towel), and proof for one hour. Remove onto a floured surface, and divide the dough in half. The dough is quite soft and extensible, much like ciabatta. form into pizza rounds. Let it rise on parchment paper for about five minutes. Coat the dough with about a half tablespoon of olive oil, then one cup of tomato sauce. You can use your favorite, or make your own. When we buy it, we get Red Gold. Add just under a half pound (one small block) shredded mozzarella (or provolone), then top with fresh basil and oregano. Bake the pizza on the hot stone for 4 minutes, then rotate and bake another 3 to 4 minutes. Transfer to a wire rack and let it cool 10 minutes. This is important! If you use the two stone method to bake both at once, switch positions when you rotate the pizzas. I use King Arthur, like many others on this site, due to its consistantly high quality. 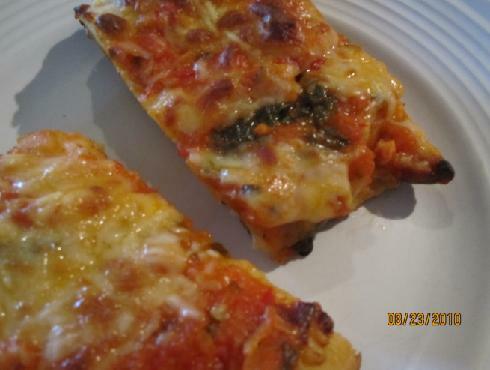 The pizza is made with bread flour, but could also be made with the Sir Lancelot high gluten flour. Here's the rest of what I did. Mix well, knead by hand for a minute, then transfer to a bowl. Cover, and let sit at room temperature for an hour. Refrigerate overnight. The next morning (12-14 hours later), remove it and let it come to room temperature, for about three hours. Break up the sponge in the water, then add to the flours and salt. Mix on speed six with a dough hook for six minutes, or by hand until it becomes a smooth, firm dough that is slightly tacky to the touch. Ferment three to four hours in an oiled covered container, then shape however you want. I chose a bread pan to make a sandwich loaf. Cover and proof for one and a half to two hours. Bake in a preheated oven at 375 degrees for 40 minutes. The crust should be smooth and dark, and a thermometer should read 205 degrees. Remove from pan to a cooling rack, and allow to cool completely before devouring. It has a nice, rich sweet wheaty flavor that melts into a mildly sour tickle at the end. And finally, baguettes again. Almost perfect this time. The focaccia will have to wait until we have reduced this surplus of goodies. Thank you for sharing this great recipe! In fact, I tried this once before, but that was totally a failure because I was using BLEACHED FLOUR. How ignorant I was! I almost killed my starter too. I have fed my starter BLEACHED FLOUR for 2 days! A week later, today, I tried again and I finally got a good result! What a wonderful bread! They are not sour at all. That was what I was looking for. I didn't put them in a refrigerator, I placed them in the basement for 9 hours. ( tempareture was around at 69F) and I didn't have a time to proof more than 40 minutes so that I shaped them into batard. They were burst but they were very tasty. I realized that these bread were tough. It was good when I ate it yesterday. I think that they were underprooved. Next time I better have a plan to have enough time for proof before baking. Yes, they are underproofed. Your crumb is a bit tighter than it should be. The bread, if stored in a bag, should stay soft a few days. I was eating the remnants of a loaf five days later (stored in an air-tight plastic bread bag), and it was still soft(ish). They do look good, though. You do a great job with scoring and promoting oven spring. I like the idea of letting the loaves ferment in a basement, but my cats have the run of mine. I fear any dough to go down those dark steps would never return to the kitchen. I do look forward to the day when I have a farmhouse with a cellar. Sausages and cheese and canned goods (and now, bread dough) will abound then. Your response is very helpful, Matt. Thank you for the information, Matt. I see, They were underproofed as I knew. The dough were not ready to go in the oven because they were as not puffy as I usually see for the dough are ready to bake. I wanted to put the loaves in some plastic bags before going to bed. but they were still warm, so I left them in the kitchen over night. That was another bad idea. 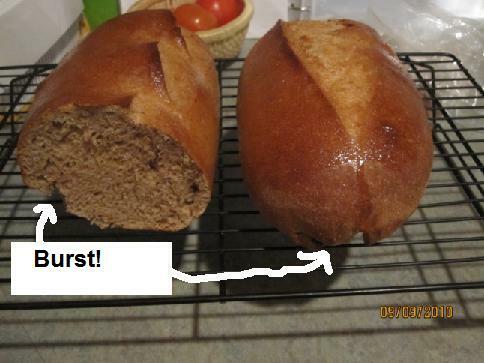 I usually put bread that I bake in air-tight plastic bags and keep them in a freezer. In addition to preserve food,I do keep peeled some gloves of garlic and white eggs in a ziplog in freezer too. I also soak some ginger in a container with water and keep in a refrigerator. I change the water every a couple days. I love to keep my starter in a cold place instead of putting in a refrigerator too. Your idea that have a farmhouse with cellar is a great idea, Matt! Thank you for your pizza recipe! I made your pizza today, and that was a big hit! Thank you so much. This pizza reminds me of crispy pizza that I ate at a restaurant "Chianti" in Ginza, Tokyo, Japan. The pizza dough was extremely think but the flavor was the same. I was amazed how sweet the dough was without sugar. I liked the texture too. I keep this recipe definitely. I couldn't get such a moist crumb like you had on the picture though. Would you mind telling me about the water temperature? I used cold water. Yes, the crust is quite nicely flavored, if I do say so myself. It took quite a bit of trial and error to create this, so I do most sincerely appreciate the compliments. I use lukewarm water. You may need to add a bit more, depending on humidity and the flour. Try adding a teaspoon more at a time. Also, you want to be sure the oven is blazing hot. That helps with the dough's spring, although yours looks very nice and light. Your first go looks like a great success. I am glad I could share this with you. Next time, LUKE WARM WATER... and so on... I got it!! Happy baking and thank you again !!! 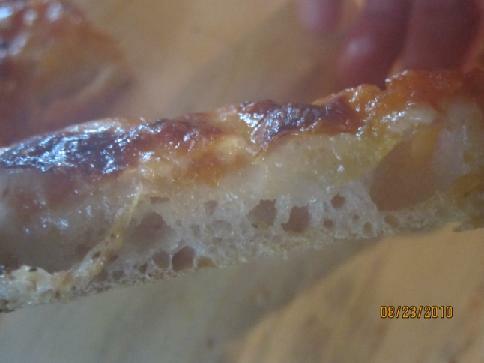 You may want to handle the dough gently when forming the pizza, too. Notice mine are not a perfect circle or rectangle. I pat the dough gently, then pick it up and stretch it to the right size. Overworking it might also contribute to the slightly less airy crumb. You may be degassing it too much. I am happy to give you a treat for your family. Mine loves it as well. If I tried to make any other, I would fear for my safety. That's how serious they are about it. You are most welcome. I will continue to post new recipes as I perfect them, and I may be open to specific requests. It is only a small blurb in the instructions, but I do mention that it is bread flour. More specifically, King Arthur bread flour. Thank you for another great infomation. Yes, I was patting and stretching the dough too much. This is like handling a french bread dough!! I can't wait until I make it again. And, I am looking forward to seeing your new recipes!! I will be travelling to an Amish store soon, and I will buy some bulks of different flours (high gluten, course mill, semolina, etc. ), so I expect to come up with some new recipes in the next month. I will certainly share them with all of you. Everything looks so awesome!! I am defnitely going to have a go at your Honey Wheat Sourdough, will post results. Wish the newbie luck!!! Wish you the best of luck. Your success means my recipe is good. I like multiple test results, so definelty let me know how it comes out. about the pizza dough: it makes great breadsticks. Oil the dough after stretching it, then use a garlic press (or you can finely mince it) to smash a few cloves into a small amount (about a half a cup) of shredded provelone and parmasen cheese. Mix it up, and sprinkle that on top the dough and bake as usual. Goes a treat with pasta, or as a sandwich with pepperoni or salami trapped between a couple slabs of it. My kids will love your breadsticks. Honey Wholewheat came up beautifully! What a delicious loaf, great flavour. I had no problems at any point with your recipe, thoroughly enjoyed making this loaf, thanks Matt for a great recipe. I didn't bake mine in a loaf tin but shaped it into a batard, it didn't rise as much as yours but was still good. That is absolutely beautiful! Congrats, and good job. I may make it without a loaf pan next time, because your scored crust looks very nice. Made this last night, It turned out fantastic. Crispy and Chewy! 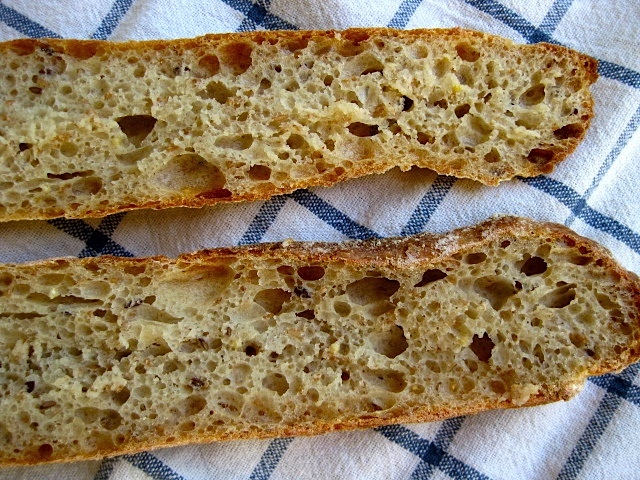 Open crumb. Really very good. Next time I think I will try an overnight fermentation to obtain more flavor. I would post crumb shots, but it was eaten before I got the chance, But it was just like all the others in this thread. Very ciabatta like and just a delish. That looks fantastic! Great work. I am glad so many people have enjoyed my recipe. I'm in the midst of developing another for brown multigrain sourdough I think will be a winner as well. I was able to get my hands on some Italian type 00 flour. Do you think I can use that flour in lieu of bread or AP flour for the pizza dough, and if so, how would I need to re-adjust the recipe? I just made a batch of your dough using AP flour. It is now fermenting and I can't wait to see how it turns out. The next time I do this again, I'd like to use the Italian flour though. Thanks for letting me know. Hmmm...the 00 flour is finer than KA AP or bread flours, but since you are measuring by weight instead of volume, you should be alright with a direct substitution. If you find the dough to be a little stickier than it should be, you can let it be and have even bigger bubbles in your crumb, or you can add a small amount of high absorbency flour, such as whole wheat, semolina (my choice), or spelt. but no more. I was not convinced that a dough that has undergone only 1 hour of fermentation would yield something flavorful and tasteful but I was wrong. This pizza dough was pretty good. I had a good crust with enough air. I do not know how to roll a pizza properly so I am still playing with all of that. I can't wait to see what kind of dough the Italian 00 flour will yield. Thanks for sharing your recipe Matt. Thank you very much. I am glad you gave the recipe a shot. I know the general rule is long slow fermentation equals flavor, but there are other techniques for developing good taste. Many people use an overnight bulk ferment to gain a flavor advantage, but I created this formula due to the fact that when my family wants pizza, they are not disposed to waiting until the next day. In fact, I have a hard time convincing them to wait the hour and a half from mixer to plate it takes to make these pizzas. Also, you don't roll pizza dough (at least not this one); you lightly suggest where it should go if it is so disposed. I gently stretch it and use my fingers to press it until I get an approximately roundish, squarish shape. Maybe the next time I make this probably this weekend) I will do a little video showing how I shape the pizzas. That might help some who are having trouble. Let us all know how the double zero works out. Maybe it will be worth the effort having some shipped to me. I ate some of it last evening but decided to use the other half today after it underwent an overnight fermentation. Brought it to work and my Italian colleagues (picky eaters!) really enjoyed your dough. By the way, no worries about my ROLLING out the dough. I only used the word "rolling" to mean strectching, then rolling, but it was always clear in my mind that I wouldn't be rolling the pizza like I would do with a pie dough. I will try the type 00 substitution and report back. Unfortunately, as I have posted on other threads, I am awful at manipulating and shaping the pizza so my end result will still be so-so due to my poor handling. Your video will be a joyful input. Finally, would you mind explaning why your dough, albeit the short hour fermentation, yields good flavor and taste (which is contrarian to the "long and slow fermentation" rule). I am not savvy enough to understand what it is about your recipe or process that makes that result. Thanks again Matt! Ha ha, if the Italians like it, I know it's good! If you really want to impress them, do this as pizza alla romana. Make it really thin (like, you could get three or four out of one batch of dough), then top with good olive oil and course sea salt. Bake it until it is nearly charred, on your oven's highest setting. Take it out of the oven, and drizzle on some more olive oil. Or bake it with a thin coating of fresh crushed tomato juice for pizza rossa alla romana. Well, the flavor compounds come from the sugars breaking down in the flour, and byproducts of the yeast (and also, of course, salt). By using such a high hydration level, and warm water, the flour is breaking down more quickly than a lower hydration. You're actually oversaturating the flour, giving it more water than it can absorb. This causes a rapid breakdown of enzymes and other proteins. Hence, quick gluten and flavor. This recipe calls for about double the yeast as most recipes. That means more little helpers giving off carbon dioxide (hence the bubbles), as well as feasting on the flour and emitting their flavor compounds. Finally, the hot oven quickly browns the sugars in the crust, for that final kick of flavor. The end result: yummy, chewy, pillowy, pizza crust. Funny that you would say that...ie impress them with a thin crust cuz that is exactly how it turned out. With your recipe, I was able to make 4 pizzas (2 eaten last night and 2 taken to work today to bake them....yah, great job where I can actually cook - cool!). I made my own homemade tomato sauce but forgot it on my kitchen counter. I ended up having to sprinkle oilve oil and a few herbs ...then just baked them as - is. That"s what my colleagues went wild for. I personally thought the crusts were a tiny bit too thin but that is just a matter of taste preference. Will use your recipe to try out the type 00 flour next. Cheers. As promised, here is my report after using the type 00 flour with your recipe. First, I'd like to mention that the type 00 flour I bought had no other information on the package (written in Italian!). From reading another thread, not all type 00 flours are conducive to baking pizza. Apparently, protein content, W coefficient, bla bla bla, nothing I know about, are all factors one needs to consider when using type 00 flour for pizza. Hence, I am not even sure that the type 00 I used was the right flour for pizza. Secondly, since I have never eaten pizza that I knew was made specifically with type 00 pizza flour, I have no point of reference to compare my own pizza. Having said that, I have tried your recipe 2 times with the type 00. The first time, the pizza came out pretty OK. From the same batch, I was able to make 4 dough balls. 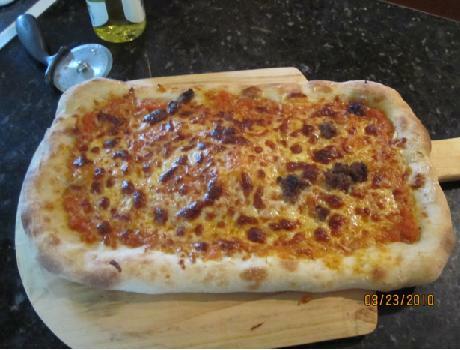 I did not think there was much difference between the pizza made with the type 00 and the one I made using AP flour. I do admit that the crust made with type 00 was slightly better, with more air, but only with the second dough ball. 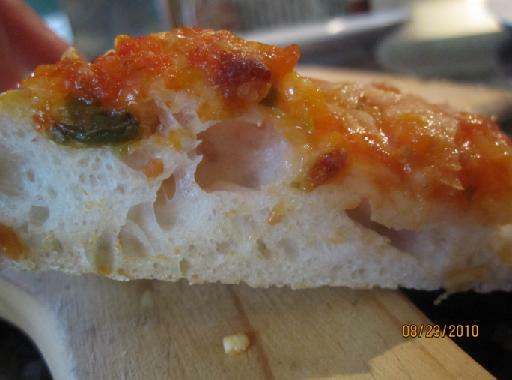 The first dough ball was slightly overcooked so the pizza dough was a bit hard, too thin and rather tasteless. The second dough ball had much better results. On my second trial (ie this pm), I again divided the dough into 4 balls. The first pizza was really good. In order to prevent the pizza from being overcooked, I monitored it closely and the result was very tasty. Thin pizza, nice crust, decent holes. However, the second pizza was OUTSTANDING. Same thin pizza, bigger holes, but I also had a nice chewy crust. Things are getting better and looking up! Hubby and friend both thoroughly enjoyed the experience. My friend is Italian and he thought I made an even better pizza than his sister (their father was an Italian chef). No worries, I gave all the credit to you and your recipe! I can't say for sure whether using type 00 did anything as I do not have enough data/experience to compare, but I will have to go back to AP flour again and perhaps the next time, I would be in a better position to see the differences, if any. Again, very very happy with your recipe though. Quick and easy as heck. Still a lot of room for improvement though cuz I don't think mine looks quite as nice and HOLY as your pizza crust above. Cheers. Thank you for the great info. And the compliments. I love when I am told (often indirectly) by Italians that my pizza is better than other Italians' pizzas. It's a huge boost of confidence. Although, I guess nationality really need not dictate a proclivity toward a given task. I know Mexicans who cannot cook huevos rancheros, but make astounding bulgogi. Funny old world. Madruby, Italian 00 flour is a soft wheat flour with much less protein (8-9%) than bread flour (12-15%) or even AP (10-12%), about the same as pastry flour. It is standard four Pizza Napoletana, a very soft dough that has to be gently stretched to achieve the desired irregular shaped crust. I can't show you the difference in pizza crusts, but I can show you what these different flours look like in the crumb of some of my breads. Pain a l'Ancienne, made with bread flour and a little bit of multigrain mixture. I found that pastry flour comes very close to Italian 00 flour, so it is a substitute. Matt, have you experimented with freezing the dough after mixing, before letting it rise? Just wondering. I sure haven't. I developed the dough in response to my family's insistance that they spring on me at the very last minute when they crave pizza. So I've had no occasion to freeze it. I assume it would work much like freezing any other dough. Their is certainly enough yeast to survive the chill, but the excessive wetness may cause ice crystals to form, depending on your packaging method. Thanks, Matt. Your pizza was so easy to make. Everything worked just like you said it would. My DH likes more "stuff" on his pizza, so next time I'll doll his pie up with tomatoes, mushrooms and maybe sausage. I'll continue to make mine just the way you wrote it. ;*) It was especially good since I got the basil and oregano out of my very small herb bed. 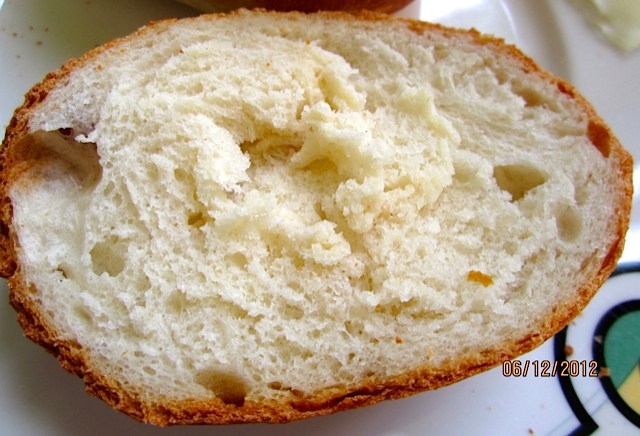 I'm starting your honey wheat bread tonight, but I'd also love the recipe for the white bread you showed us if you would care to share that one, also.